So this is the weekend we've all been waiting for – the release of the latest entry in a decades old franchise, beloved by the young and old alike, with funny creatures and a cultural legacy of its own. I'm speaking, of course, of the latest Alvin and the Chipmunks film. Okay, okay, stop throwing things. Of course, we're talking about the release of Star Wars: The Force Awakens, the latest in the horribly subtitled tradition of this franchise. Ever since the announcement three years ago that Disney had purchased Lucasfilm for the bargain basement price of $4 billion, people have been awaiting this moment. While that would have been a great price for the merchandising alone, it naturally led to the thoughts of more movies. And how could they not – as it's probably the most valuable IP in film, with the possible exception of the entirety of the Marvel Universe. I'll actually be discussing very little of the plot of the film itself in this column, for the reasons of a) you probably are already familiar with it as much as you need to be and b) it's largely irrelevant to the film's performance. 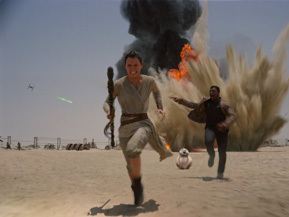 It's a new Star Wars film, and what it's about isn't going to change your mind about it. What is important is the people behind it, which crucially includes J.J. Abrams, and does not include George Lucas, who has been rather politely shown the door, thanks for the notes *rip*. So now we find ourselves in a remarkable similar situation to 16 years ago, with the first new Star Wars film in over a decade, a Jurassic Park film holding the box office record, and a recent ramp up of (high-end) box office opening weekends. If boy bands were popular again, I'd be prepared to call it spooky.